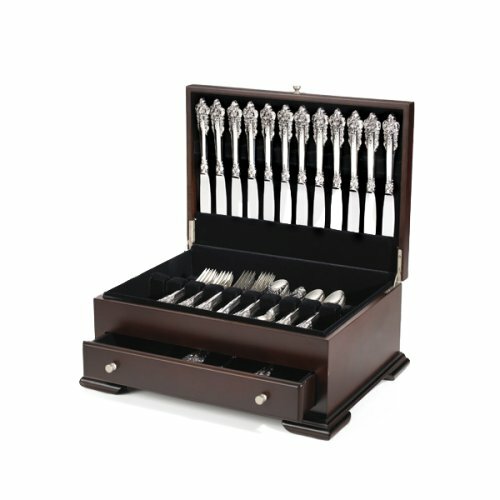 Reed & Barton flatware chest holds service 12 up to 108 pieces, lined with brown tarnish proof lining, in mahogany finish with brass lid hardware. FLATWARE NOT INCLUDED. 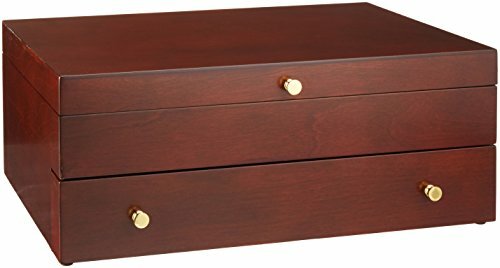 Tradition style and functional best describe the Lifetime Brands Single Drawer Flatware Chest with Feet. 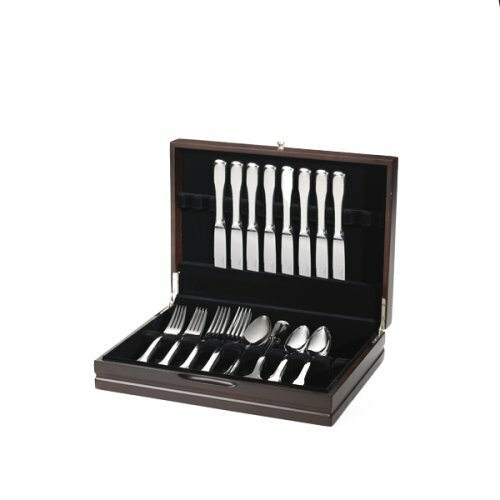 It is made of wood and enhanced with brushed nickel accents and a beautiful black soft-plush lining to protect your fine silverware. This designer flatware storage chest is complemented by the dark walnut finish, giving it a rich, authentic look that will work well with other accessories in the room. 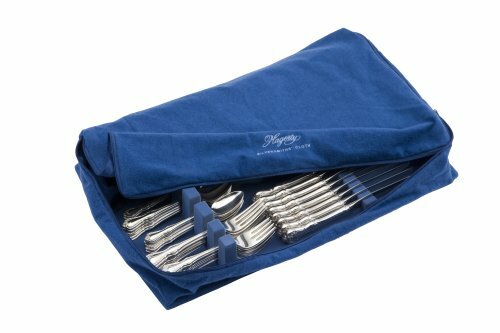 It is able to hold a flatware service set for 12, so your silverware will stay safe, dust free and all in one location. It includes a pull-out drawer that offers additional storage for serving pieces. Store your silverware safely in this single drawer chest with feet. 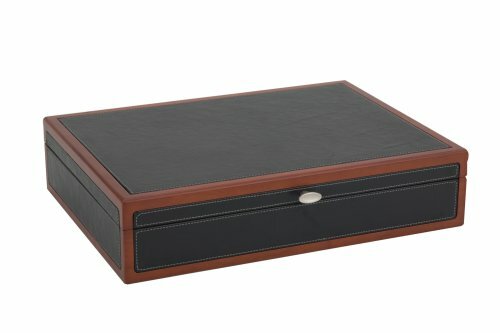 The Adams Flatware Chest offers dramatic, contemporary styling with its deep black faux leather contrasted with a rich cherry finished trim. A soft, brushed oval nickel pull punctuates this handsome chest with subtle detail. Lined in tarnish resistant black silver cloth. Holds up to 130 pieces, service for 12, including butter spreaders. 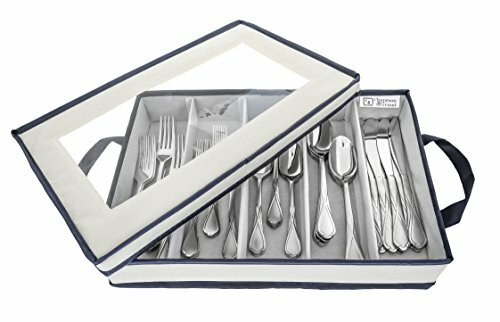 These Silver Storage Rolls are 26cm wide and hold 12 cutlery pieces, knives, forks, and spoons etc. with an individual pocket for each item. They are impregnated with special anti-tarnish agents and are made from exceptionally high quality cotton, densely woven in the "Satin" style. They are not only luxuriously soft but are virtually air tight with a tie-string closure. This is a must have product for anyone with a silver cutlery set. This product is made in the UK. This larger Drawer Liner Pad by Reed & Barton is perfect for those with larger flatware sets. 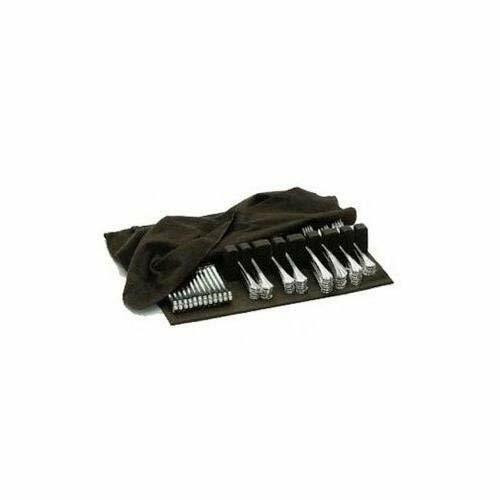 You place it in a drawer to organize and protect your flatware with its tarnish-resistant silver cloth blanket for protection. 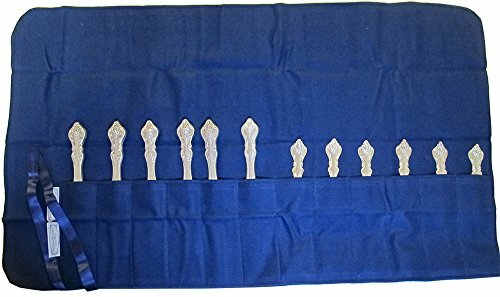 Shopping Results for "Silver Flatware Organizer"